I wish I had a great story for how this tangle came about but, I don't. I have been drawing this tangle for about 2 years but never got around to posting the step out. I think I was just messing around one day and it started to take shape. 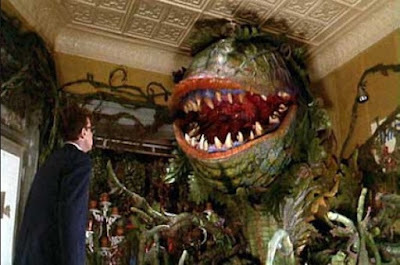 What I do remember thinking is that it reminded me of the giant carnivorous flower in the 1986 movie Little Shop of Horrors. Little Shop of Horrors stars Rick Moranis as a timid man who works at a failing floral shop called Mushnik's. He discovers a new plant and names it Audrey II in honor of his co-worker Audrey whom he is in love with. Audrey II however has a dark side and if you want to know more, you'll just have to watch it! but everything in Zentangle is a little abstract, right? So the obvious question is why name it Mushnik and not Audrey? 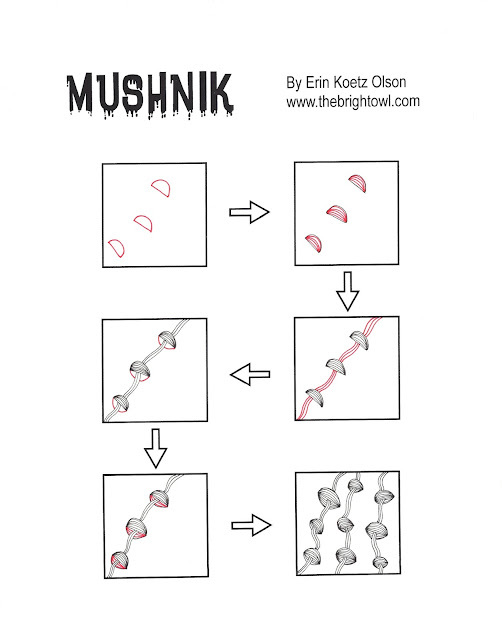 Because I think Mushnik sounds cooler. The End. Where did you get the idea of naming it Mushnik? P.S: really wanna say this...Zentangle is an awesome blog! Wish you guys lots of luck. Take it to the next level.